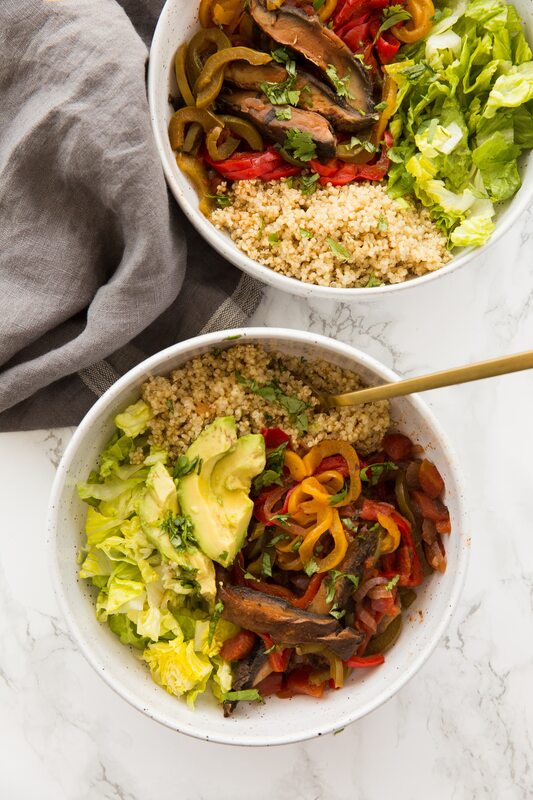 Easy vegan and gluten-free fajita bowls with portobello mushrooms and spiralized peppers and onions, made in a pressure cooker. Since starting to cook food for Luca, I’ve really been into my pressure cooker. It’s great for cooking spaghetti squash (which he loves) or just making super quick and easy meals, like today’s recipe. I love using Portobello mushrooms as meat and carb alternatives – as burgers, as burger buns, as meat (have you made the Mushroom Bulgogi Bowls from my new cookbook?) – because they are so hearty! 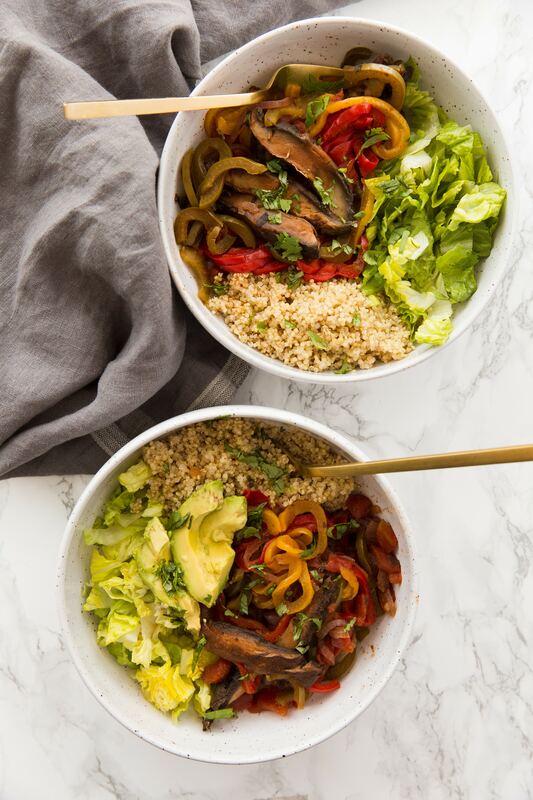 These bowls are seasoned with my homemade fajita seasoning that brings the peppers, onions, and mushrooms to life – you won’t miss the meat! You can serve these with brown rice instead, cauliflower rice if you prefer, OR you can ditch the bowl altogether and have them in taco shells! Hope you’re having a wonderful Sunday – and tomorrow, I’ll be sharing my socca flatbread pizza! I guess it’s a meatless week! Cover and cook on high pressure for 8 minutes. Meanwhile, prepare the bowls. 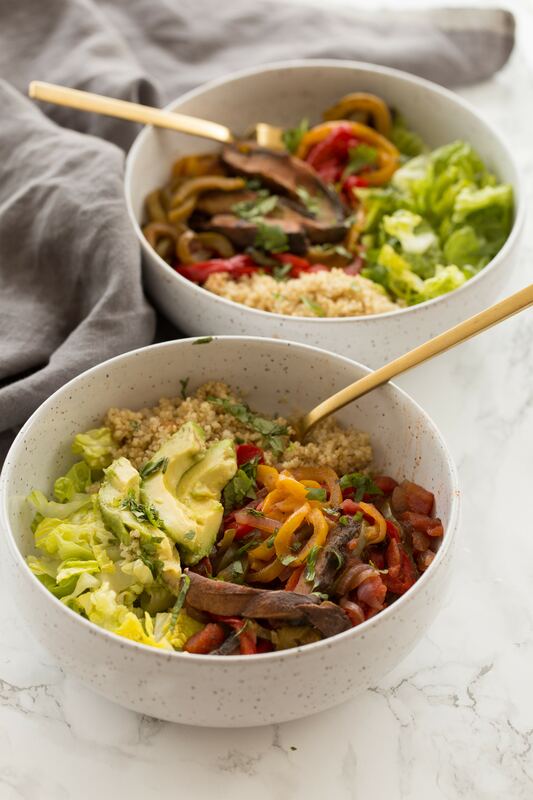 Divide the avocado, quinoa and lettuce into 4 bowls. Quarter the lime. Once the time is finished, let the pressure release naturally and then, open up. Using tongs or a slotted spoon, divide the fajita mixture onto the prepared bowls, garnish with cilantro, and serve with limes. Thanks for another pressure cooker recipe, especially a vegan one! This is my favorite way to cook right now and it’s great to have you as a resource! Is there no added liquid? Just the juice from the diced tomatoes is enough? Otherwise this looks great! Can’t wait to try it. Can these be made without a pressure cooker? How do the leftovers hold up in the fridge for meal prep? I drained off some of the liquid for leftovers/meal prep. This recipe is delicious and perfect for meal prep! Look yummy! Can’t wait to try it.